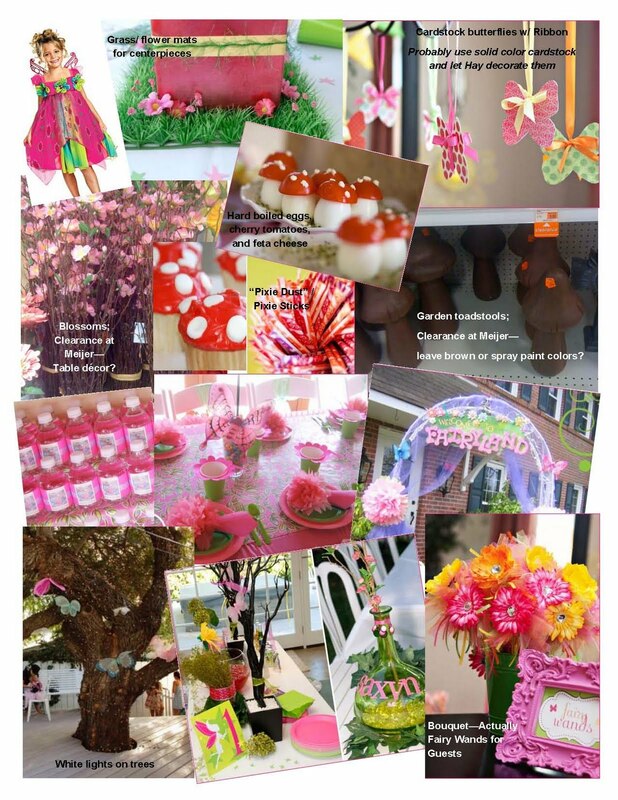 It was this website/ blog that gave me inspiration last September for my daughter's fifth birthday party. It started with an idea and Haley's love of fairies, but I knew I didn't want to do a literal 'Tinker Bell' theme. So I began taking pictures of items while I was out shopping, ideas from other blogged parties, and online research for food and drinks. I made an 'Idea Board' pictured below that helped me to keep my focus on what I was trying to accomplish and to continue to draw inspiration from! I created her invitations on my computer using Microsoft Publisher then printed them multiple copies per page. After printing, I used some scrapbooking paper I got on clearance at Hobby Lobby to make a border and embellished with glitter stickers Haley picked out. Water Bottle Labels: I made them by using scrapbooking paper, glue, and added stickers, ribbon, or cutouts to each bottle making it unique. She made the dress using toule, applied flowers around the chest, and added a ribbon around the neck. She took store bought wings and applied a flower to the center. I purchased a matching headband and flower clip from Hobby Lobby. 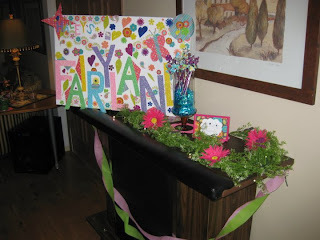 FAIRYLAND: When people entered my folks house (they were gracious enough to host the party at their house for me) they were greeted by a sign Haley and I made together that said "Haley's Fairyland", along with a table of decorations and fairy wands for each guest. I made the signs using picture frames I bought at Target (set of 4 for $2.50), placed scrapbooking paper in the background and wrote each themed description. This one being "Fairy Wands". Fairy House: The weater was suppose to have been nice that day. (It ended up being windy and chilly... I love Michigan.) Unbeknowst at the time, we decorated her playhouse outside as well calling it the "Fairy House" adorned with lights above, tissue flowers, butterflies, and toule bows. 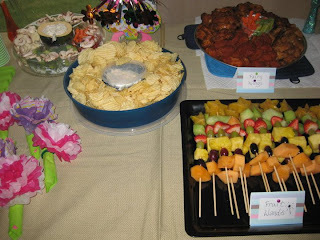 FAIRY FOOD: Probably the most fun part about the planning and the party was the food! I made tissue flower napkin holders using tissue paper and pipe cleaners. One of my favorite things was the Toadstools! Made from hardboiled eggs, tomatoes, and the spots can be done using a cream cheese, sour cream, or feta. I ordered a mini-sandwich platter for the "Pixie Sandwiches". Notice in the background I even made labels for the mayo, salt, and pepper to match our theme. A chicken wing assorted platter, appropriately called "Fairy Wings". I made fruit kabobs, using starfruit vertically placed at the top making them "Fairy Wands". Toadstool Cake & Fairy Cupcakes: Since my daughter has a severe peanut allergy, I always make her cakes myself. For the "Toadstool Cake" I made a white cake with strawberry icing and cut mini-marshmallows in half, sticking them all over to be the spots. I also used a small piece of sarand wrap, placed directly under the tinkerbell doll so that she wouldn't get dirty. The cupcake holders and Fairy Toothpicks used for them were from my girlfriend Krista. I was lucky enough to get the Tinker Bell Doll on clearance at the Disney Store for $9! ... I just have to figure out what to do for it! I'm so excited to see your pics for Sammy's though! !